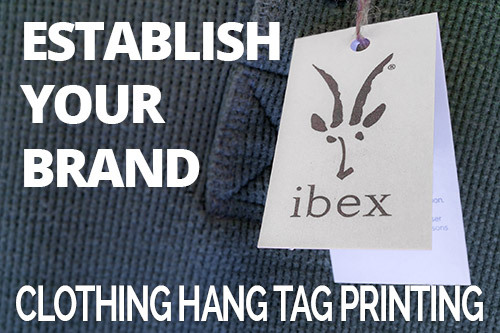 As a new clothing brand or market-testing, finding a printing business willing to take on a short-run hang tag printing project can be challenging due to fixed set-up costs. For more than 4 decades, we’ve been in the short-run package printing business, working closely with small and mid-sized businesses throughout the Midwest to deliver quality printed packaging solutions for test market and niche products. In the textiles business, your brand is everything. How you represent yourself from logo design to how your hang tag is affixed to your apparel is an expression of the perceived value to the buyer. Our hang tag printing service provides exceptional flexibility at a competitive price for short-run and medium-run print projects. We can design, print, coat, and die-cut custom hang tags for clothing, giving your brand the uniqueness and professionalism you wish to express. Our custom clothing hang tags are printed on recyclable, compostable material for a low environmental footprint and use cutting edge inks that are both vibrant and more environmentally friendly.